Wash the fresh green beans. Cut off the ends and use a very sharp knife to carefully slice them lengthwise. Add the water and a teaspoon of salt to a medium pot and heat over medium heat. When it comes to a boil, add the green beans and cook for 3 minutes, al dente. Strain and place them in a bowl filled with water and ice to set the color and stop the cooking. Let it rest for 5 minutes and strain. In a small skillet, heat 1 tablespoon of olive oil over medium-high heat. Add in the onion until it's cooked through, about 5 minutes. Add the mushrooms and cook for another 3 minutes, stirring occasionally. Let it cool. Place the sliced and cooked green beans, onion and mushrooms in a bowl. In another medium bowl, use a hand mixer to beat the eggs, flour, salt and pepper until incorporated. Pour the egg mixture over the vegetables and stir with a fork. Place a large non-stick skillet over high heat until splashed water drops sizzle and evaporate almost immediately. Lower the heat to medium. Add 1 tablespoon of olive oil, and place a generous tablespoon of green beans in the skillet. Gently smash to form the fritters and let them cook for 6 minutes without moving them. Turn them over with a spatula and cook for another 6 minutes. You can make 3 or 4 at a time, depending on the size of your skillet. Once they're ready, place them on a plate lined with absorbent paper towels, and continue with the rest of the mixture until finished. Green beans are also known as ejotes, chauchas, porotos verdes and judía. They can be reheated in the oven (325°F) for 12 minutes, or in the microwave. Pilar Hernandez Here's a different alternative combining flavors that go very well together. 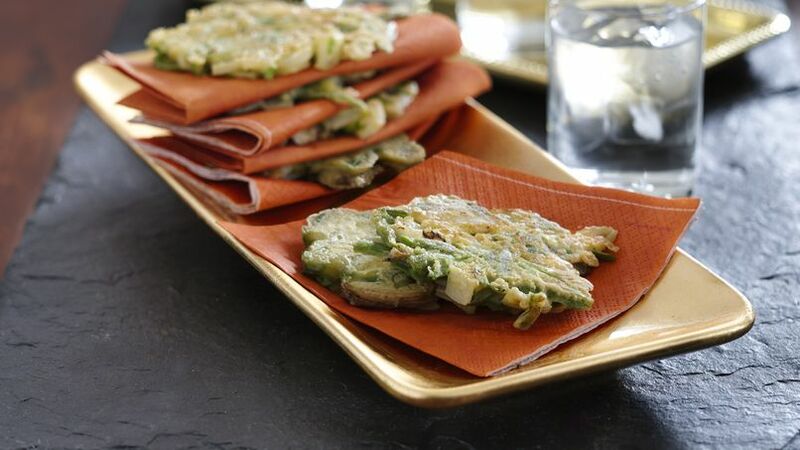 Green beans, mushrooms and onions come together in these delicious fritters. Enjoy!